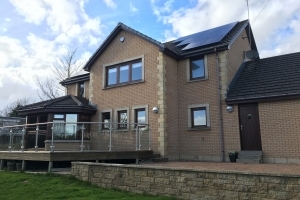 Mountcairn is a domestic property which has underfloor heating designed to operate at 30C. The home owner, Mr Burns, has bills for gas (heating and hot water) and electric (domestic circuits and lighting) and his aim was to become as self-sufficient as possible. While a PV and battery storage system is not unique, the unique part is that the solar-powered Immersun heats a pre-heat cylinder which is linked to the central heating and contributes to heating the house. Given the low operating temp of the UFH system then the solar PV will manage to not only reduce electrical consumption but gas as well. We will be very interested to see how much the customer saves over the course of a year and we’re hopeful it will provide a valuable case study and blueprint for well-insulated homes which have underfloor heating. 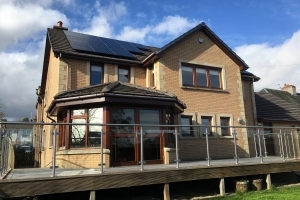 Solar PV – We always recommend SunPower panels to our customers because of the fantastic 25 yr product/service warranty, the long life expectancy, enhanced performance and their environmental credentials (Cradle 2 Cradle). However, Mr Burns also wanted to maximise his power output per m2 for his small(ish) roof space. Using the SunPower X22 360W modules we were able to fit 21 panels on his roof to give 7.56kWp. 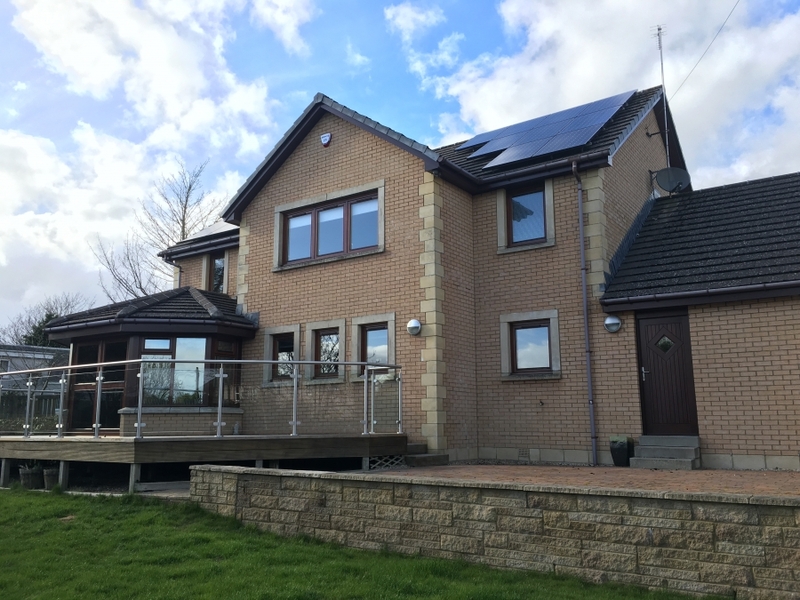 Inverter – Solaredge give us great flexibility when designing a PV system and the DNO (Scottish Power) told us that we would need Export Limitation due to grid constraints in the area. 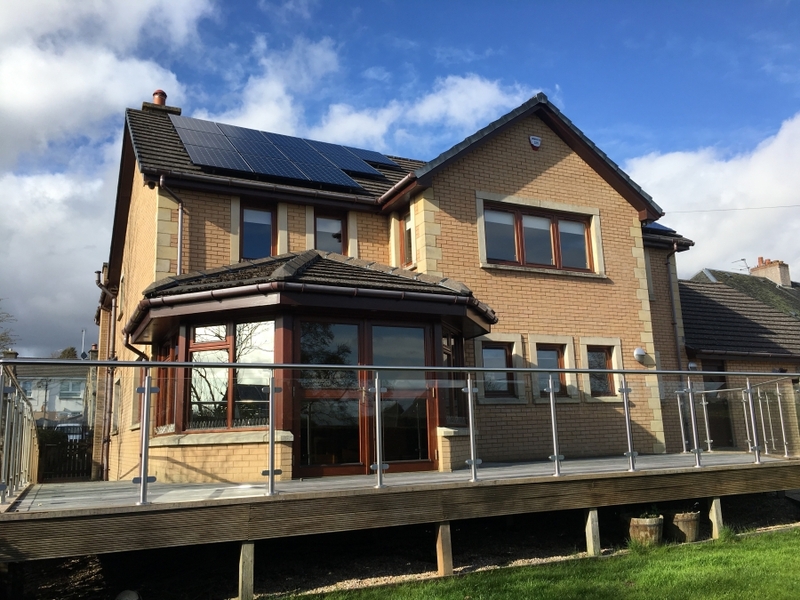 The Solaredge system allows us to easily set up export limitation as well as the other beneficial features such as optimising power output from each panel. 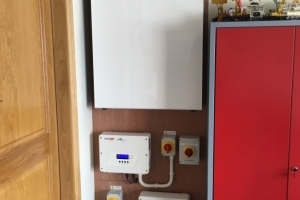 Battery storage – Mr Burns wanted to be able to use excess solar PV power at night and so the 13.5kWh capacity of the Powerwall 2 give him this ability. In addition to the simplicity and aesthetics of the unit, he now has access to the “Advanced Time Control” feature which will allow Mr Burns to charge from off-peak and use that power at on-peak times (i.e. in winter when/if there’s not enough solar PV power to charge the battery). Pre-heat Cylinder – The existing central heating system was designed to operate at 30C for the underfloor heating (UFH). Ignite Plumbing modified the system and installed a Pre-heat Cylinder which can be heated to 80C giving us a significant heat dump for excess solar PV power using the Immersun. Using pumps and temp. sensors, the water in the pre-heat cylinder can then either be used to heat the hot water cylinder and/or to be blended down to 30C to heat the UFH. Immersun – The immersun is designed to divert excess solar PV power to the pre-heat cylinder once the Tesla Powerwall 2 has been charged. The system was installed on 26th April 2018 so has only been running for a short period of time and during the better weather so the impact on heating is not yet fully known. However, since installing the property has been 90% self-sufficient and the solar PV has generated >2,750kWh of the estimated 6,300kWh per annum. 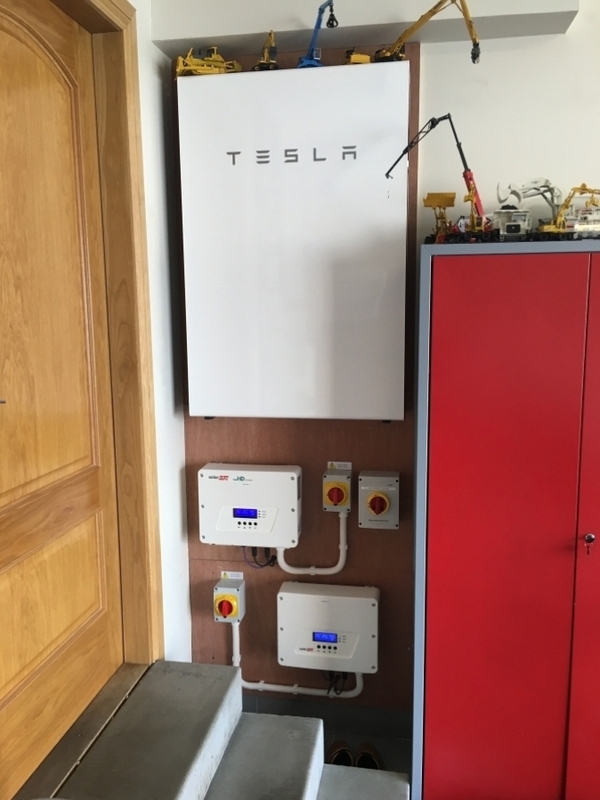 “I had been getting fed up of the rising energy costs to heat and power my home and so I got in touch with Ceiba Renewables when I realised they were a Tesla Powerwall Certified Installer. We discussed the various options and I was impressed with the expertise shown by Duncan. Not only is the solar PV system able to produce electricity for my home day and night but it’s able to contribute to my heating as well which is a fantastic feature that I’m delighted with.